This Gilbert Eclipse II Hook & Loop Netball Dress offers an excellent all-round performance so be sure to be the stand out player in this Black and White Colourway number. This dress comes with mesh panels for ventilation when working hard on the court and shaped contrast panels for a flattering, slimmer appearance. Made from 90% polyester and 10% elastane, the stretch fabric adds comfort whereas the scoop neck provides an unrestricted fit. 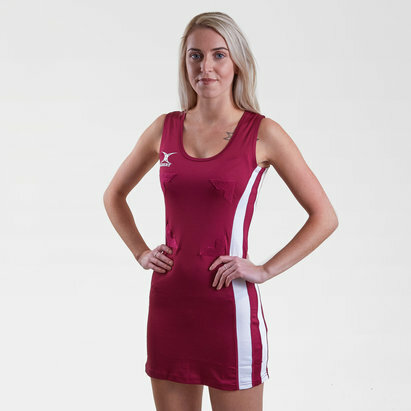 Finished with hook and loop attachments front and back for patch bib with court position, dominate the court in this Gilbert Eclipse II Hook & Loop Netball Dress. Matching Shorties complete the look and feel.